Four years in ACC play, zero ACC Tournament wins. 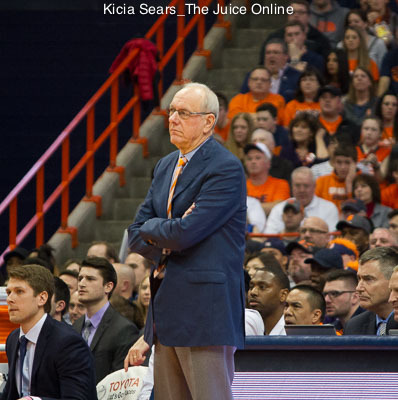 That is a stat that will continue to haunt Syracuse as they dropped a 62-57 game in the second round of the ACC Tournament to Miami in Brooklyn, New York. The Orange (18-14), whose conference tourney loss last year nearly cost them an NCAA Tournament appearance, are again forced to see if their postseason defeat will keep them out of the Big Dance. 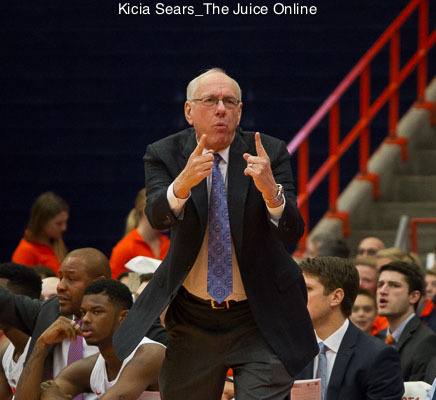 The Hurricanes (21-10) led for most of the game, allowed SU to hop in front briefly in the second half, then regained control and kept just enough of a cushion to pull out the win. The two teams mostly mirrored each other on the stat sheet, down to hanging up impressive offensive stats in the first half and clamping down on defense after the break. Miami blistered the nets to the tune of 61.9 percent in the first half while Syracuse hit 52.4 percent of their shots. Following halftime, the Orange made only 34.8 percent of their field goals while holding the ‘Canes to 30 percent from the floor. Taurean Thompson got things off to a positive start for SU, beating the shot clock on both of the first two possessions with a quick shot from ten feet and a hurried lay-up. Thompson’s soft touch helped the Orange grab a quick 4-0 lead. Miami responded with the next ten points of the game to take the lead, then held off Syracuse for next five minutes. The Orange eventually came back to get the best of the Hurricanes, scoring eight straight points. Andrew White III started the stretch by driving in from the left wing and banking in a lay-up. Tyus Battle drove the left baseline on the next SU possession and hung in the air to muscle in a lay-up after being fouled. Battle dropped in the foul shot, then swished a three from the left side on the next trip to knot the score at 19 a side just past the midpoint of the half. Syracuse found that good fortune unacceptable and promptly allowed Miami to score ten of the game’s next dozen points and take a 29-21 lead with just over five minutes left in the opening half. White III was the only Orange player to score during Miami’s run and would prove to be the only SU scorer in the half’s final 9:47. The graduate transfer forward swished a long three from the left wing to stop the ‘Canes’ spurt, then added a pair of foul shots to get the margin down to three points. White III added a jump shot from the top of the key, but he could not stop Miami from taking a 36-28 lead into the locker room. Nearly four minutes into the second half, Syracuse went on a 10-2 run to hop in front of Miami. Tyler Lydon triggered the run by hitting John Gillon for a three from the left wing, then dished to Tyler Roberson at the rim for a lay-up. The Hurricanes put a basket on their side of the ledger, but White III knocked down two foul shots to cancel them out. Some good ball movement capped the next Orange possession with a Battle three from the right corner and a 41-40 SU lead, forcing a Miami timeout with less then eight minutes elapsed. The ‘Canes regained their composure and ran off eight straight points to regain control. In the next three minutes and change, Syracuse clawed back into the contest, chipping the gap down to 51-48 with under six minutes to play. After a Miami score, Andrew White III drilled away at that margin even more, hitting two foul shots and dropping in a floater while crossing the lane to bring the Orange within 53-52 with just over four minutes on the clock. That shot was the last SU basket for more than three minutes, though, and the Hurricanes nudged the lead out to five points in that time. Gillon did his best to repeat his late-game dramatics, pulling up in transition and swishing a pull-up three from up top to make it a 57-55 game with 40 seconds to play. Miami was able to squeeze out a basket on their ensuing possession, but Syracuse got the marker right back when Battle floated an alley-oop to Lydon for a dunk to make it 59-57. The Orange fouled twice to send the ‘Canes to the free throw line with 7.7 seconds left, where they were only able to make the front end of a one-and-one. Gillon got the outlet pass and sped into the frontcourt, looking to knot the game with a three. He pulled the trigger, but missed badly and Miami chased down the rebound. SU fouled with 0.4 seconds to play and the Hurricanes added two more foul shots to cap their win. Andrew White III led all scorers in the game, finishing with 22 points, including a baker’s dozen in the first half. 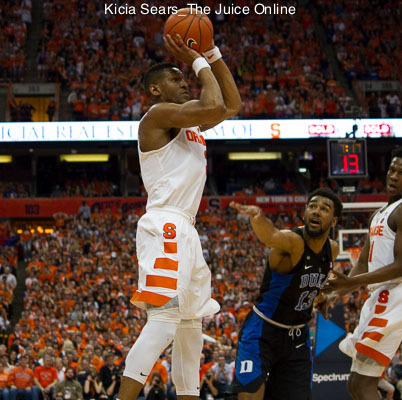 Tyus Battle was the only other SU player to reach double digits, hitting a trio of treys as he posted 14 points. John Gillon chipped in with eight points and Tyler Lydon pulled down a dozen rebounds, a game-high. Kamari Murphy led the way for Miami, finishing the day with a 16-point, ten-rebound double-double. Davon Reed added 14 points while D.J. Vasiljevic hung up 13 points, each hitting three times from deep. Ja’Quan Newton dropped in 11 points as the fourth Hurricane in double digits. The Orange now wait until Sunday to find out their postseason status.